Preheat oven to 350F. Meanwhile on a gas stove on high or skillet heat chiles directly on flame until charred. Keep in plastic bag for 5 minutes. Peel chiles under cold water. Open on one side, remove seeds. Fill each poblano with 3 strips of the cheese. Sprinkle about 2 tablespoons shredded mozarella cheese on each chile. Place in 9x13-inch glass baking dish. Bake chiles 15 to 20 minutes or until cheeses are melted and chiles are soft. Meanwhile, make tomato sauce. Place all sauce ingredients in food processor bowl or blender; process until smooth. Pour sauce into 2 quart saucepan. Cook over medium high heat about 15 minutes or until sauce is slightly reduced and dark red. To serve, place tomato sauce on plate; top with stuffed poblano chile. Drizzle with mexican style cream. Poblano chiles have a rich flavor that is perfect for stuffing. Serve with cooked rice and black beans. 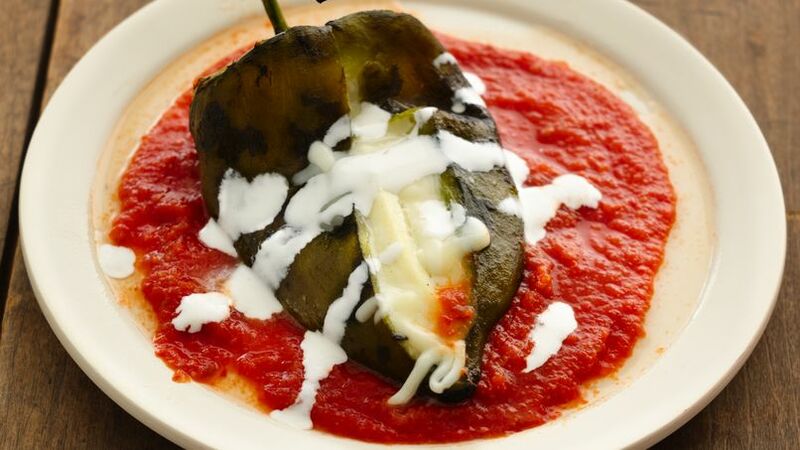 Enjoy these cheese stuffed poblanos that are served with tomato sauce – a flavorful Mexican-style side dish!